Like a lot of great country music tales, this one begins with whiskey. Willie Nelson and Toby Keith were on Willie’s bus, passing the bottle back and forth — to be precise, a bottle of Willie’s own signature brand, Old Whiskey River. They were having fun, but Toby had a serious question for his hero. “What’s the name of it?” asked Willie. “Whiskey for My Men; Beer for My Horses,” replied Toby. Many months later, Willie’s judgment turned out to be right on. “Beer for My Horses” shot to No. 1 and stayed there for six weeks. The ride actually began many years ago, way back in mid-Sept. 1976. Toby, then 15, made his way backstage when Willie was appearing in concert at the Lloyd Noble Center in Norman, Okla., as part of an “Outlaws” tour with Waylon Jennings, Jessi Colter and Tompall Glaser. At the time, Toby already idolized Willie, who was then riding high with the No. 1 Waylon duet “Good Hearted Woman” – a song Toby himself would sing with Willie months after Waylon’s death in 2002. 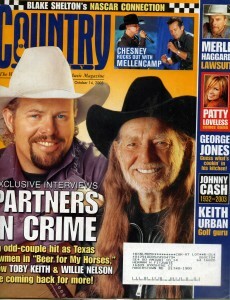 By the time they met again in the ‘90’s, Toby had followed in Willie’s footsteps to become a star himself. It happened that Toby’s guitarist, Joey Floyd, had played the part of Willie’s son in the 1980 movie Honeysuckle Rose, and still kept in touch. Joey made the introductions — and Toby and Willie’s friendship was off and running. Perhaps the most notorious occasion the two spent “hanging out” was during this year’s ACM Awards. Tongues wagged after Toby was named entertainer of the Year at the evening’s end, but wasn’t around to accept it because he’d already left. So Toby figured that spending time with his friend and idol sounded better than waiting around to not win an award. There’s always the upcoming CMAs, where “Beer for My Horses” is nominated for Single, Song, Vocal Event — and Music Video of the Year, for it’s imaginative clip featuring Willie and Toby as father and son police detectives chasing a killer. The two are lining up tour dates together, including a New Year’s Eve show. Willie is currently making a new album with Toby’s producer, which will include at least one song Toby wrote. And both men say they’re reading and willing to duet again. But one question remains: Do horses really like beer? This entry was posted on Thursday, June 14th, 2018 at 8:45 am and is filed under Duets and collaborations, This Day in Willie Nelson History, Toby Keith. You can follow any responses to this entry through the RSS 2.0 feed. You can leave a response, or trackback from your own site.